(8.1) Who is to authorize payment of family pension and death gratuity when a Govt. servant dies while on deputation? In the case of a Govt. servant who dies while on deputation to another Central Govt. Deptt., action to authorize family pension and death gratuity in accordance with the provisions of chapter IX of the pension Rules shall be taken by his Head of Office of the borrowing department. In the case of a Govt. servant who dies while on deputation to a State Govt. or while on Foreign Service, action to authorize the payments of family pension and death gratuity in accordance with the provisions of Chapter IX of the pension Rules shall be taken by the Head of Office or the cadre authority which sanctioned the deputation of the Govt. servant to the State Govt. or to his Foreign Service. (8.2) When does a family member become eligible for the grant of family pension? Normally, the amount of family pension is sanctioned and authorized at the same time as pension and indicated in the Pension Payment Order and is to be drawn after the death of the pensioner. In case of Govt. servant dying while in service, the widow or widower has to make a claim in Form 14 to the Head of Office who will sanction and authorize the family pension through its Pay & Accounts Officer. Where the deceased Govt. servant is survived only by a child or children, the guardian (in case of minor and/or mentally disabled child/children) or such child or children may submit a claim in Form 14, along with all relevant information/certificates, to the Head of Office for sanction and authorization of family pension. In the case of death of a pensioner, the deceased pensioner‘s wife or a disabled child or dependent parents or a disabled sibling should apply in Form No. 14 along with a copy of the death certificate of the deceased pensioner to the Pension Disbursing Authority. Where the pensioner and spouse held a joint account, Form 14 is not required and the spouse may inform the Bank of death of the pensioner by way of a simple letter enclosing a copy of death certificate. The paying bank will identify the spouse based on the information given in the PPO and its own “Know Your Customer” procedures. In other cases, i.e., where the pension is not being credited to the joint bank account of the pensioner and his/her spouse, the spouse is still required to submit Form 14 to the pension disbursing bank. However, the condition of attestation of Form 14 has been done away with and giving witness of two persons has been considered as sufficient. The other children will apply to the Head of Office for sanction of family pension. (8.3) Family pension is payable up to which period and in which order of members of family? a) In the case of a widow or widower, up to the date of death or remarriage, whichever is earlier. Family Pension shall continue to be payable to a childless widow after her re-marriage if her income from all other sources is less than the amount of minimum family pension and the dearness relief thereon. b) When widow or widower becomes ineligible, children below 25 years of age in the order of their age, up to 25 years of age or till they get married or till they start earning more than the amount of minimum family pension along with dearness allowance thereon. c) After (a) & (b) above; for the lifetime to any son/daughter who is suffering from any disorder or disability of mind (including mentally retarded) or physically crippled or disabled and who is unable to earn a living. d) If no spouse/children below 25 years of age/disabled children above 25 years of age are eligible for family pension, it may be granted to unmarried/widowed/divorced daughters above the age of 25 years in the order of seniority of their age. 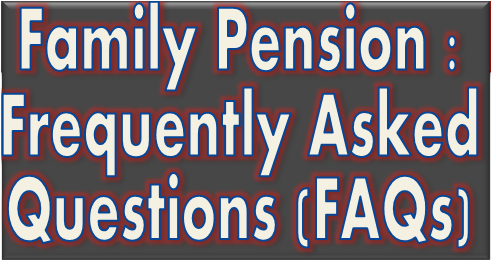 e) Thereafter, family pension may be paid to the parents who were wholly dependent on the Govt. servant when he/she was alive. f) Disabled siblings (i.e. brother and sister) who were dependent on the Government servant immediately before the death of the Government Servant, for life. (8.4) Is family pension payable to more than one person at a time? a) More than one widow (except in the case of Hindu widow or where polygamy/polyandry is not allowed). b) A widow and an eligible child through another widow which she would have received had she been alive. c) A widow and an eligible child from a divorced/illegally wedded wife; the child will be entitled to the share of family pension which the mother would have received had she not been divorced/ had she been legally wedded. d) Twin, triplet or quadruplet children. In all the above cases, on the death of one recipient, his/her share of the family pension shall become payable to other member(s) of family who was/were sharing family pension with him/her. (8.5) How is the family pension payable to twin children? (8.6) Is family pension payable to a spouse judicially separated? Family pension is payable to a spouse judicially separated provided there is no child who is eligible for family pension. But it is not payable to a spouse judicially separated on the ground of adultery and who had been held guilty of committing adultery. (8.7) Whether family pension may be sanctioned to a disabled child/dependent parent/disabled sibling during lifetime of a pensioner. Yes, family pension in certain cases may be sanctioned to a disabled child/dependent parents/disabled siblings. For further details, please refer to this department OM No. 1/27/2011-P&PW(E), dated 1st July, 2013, available at the website under the Circulars on Family Pension. (8.8) Is the family pension admissible to parents; widowed/divorced/unmarried daughters? (8.9) What is enhanced family pension and for what period it is payable? a) From 1.1.2006, where a person not governed by the Workmen’s Compensation Act dies while in service after rendering not less than seven years continuous service, the rate of family pension shall be equal to 50°/o of last pay drawn from the date of death of deceased Government Servant, payable for a period of ten years. b) In case a Government servant had died while in service after 1.1.1999 and before 1.1.2006 and his/her family was being granted family pension at enhanced rates, i.e., period of 7 years of enhanced rate had not been completed on 1.1.2006, the family pension will be allowed to be paid till the completion of the period of 10 years from the date of date of the Government servant. c) In the event of death of Government Servant after retirement, the enhanced family pension shall be payable for a period of seven years or for a period up to the date the deceased would have attained the age of 67 years, whichever is earlier. In no case the amount of family pension exceed the pension authorised on retirement from Government. After the lapse of the period of 10 or 7 years, as the case may be, the family pension is payable at the ordinary rate. (8.10) Is family pension available to a widow/widower after remarriage? Family pension to widow/widower is discontinued on re-marriage. However, Family pension has now been made available even after remarriage to childless widow of the deceased employee subject to her earnings not exceeding the prescribed minimum family pension with DR. Family pension is not available to a childless widower after his remarriage. (8.11) Whether the period of 10 years for payment of enhanced family pension would also apply in the case of a Government servant who died before 1.1.2006 and in respect of whom the family was receiving enhanced family pension as on 1.1.2006 ? Yes. The period of 10 years for payment of enhanced family pension will count from the date of death of the Government servant. These orders will, however, not apply in a case where the period of 7 years for payment of enhanced family pension has already completed as on 1.12006. Govt. servant who dies while on deputation to another Central Govt. Deptt., action to authorize family pension and death gratuity in accordance with the provisions of chapter IX of the pension Rules shall be taken by his Head of Office of the borrowing department.